Let's be Real. Not every High School is safe for GLBTQ teens. The most recent numbers say that 86.2% of GLBTQ students are harassed at school, with over 60% of them feeling "unsafe" at school and more than 44% getting physically harassed. We need to do better. And while there has been enormous progress made with GSAs and nonprofits like GLSEN to make regular high schools safer for Queer youth - there are lots of kids who TODAY - going into this new school year - don't have a safe school to attend. So now there's another option. "the world's first online high school created especially for students who are gay, lesbian, bisexual, transgender or questioning their sexuality or gender." It's a non-profit, private school based near St. Paul, Minnesota, open to students nationwide and from around the world. at the Twin Cities Pride Festival. 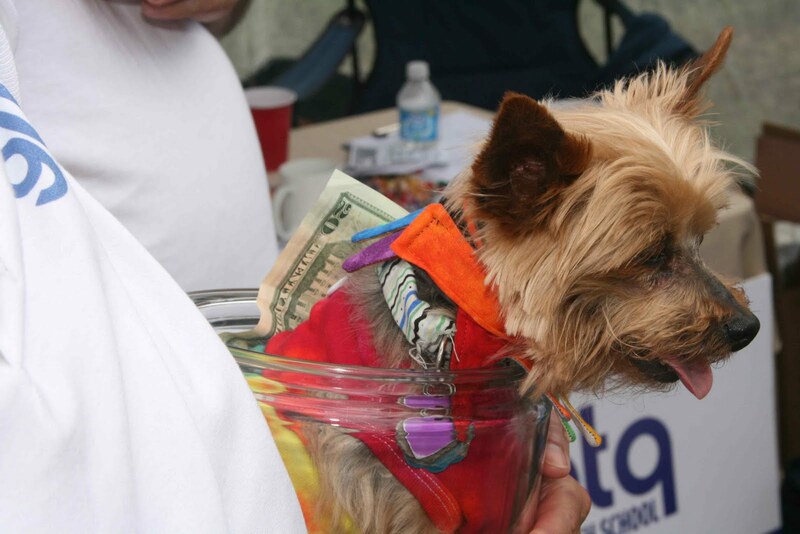 Tex, the GLBTQ Online High School's "top fundraiser"
They just announced "The Greg Louganis Scholarship Fund" to help kids who might otherwise not be able to afford attending. experiences that some schools provide glbtq students. 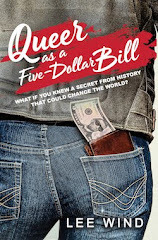 It also connects queer and questioning youth and their parents to supportive peers and community resources around the country. With all that support, students can concentrate on a high quality, college-prep education that will serve them well." I had the chance to interview David Glick, the school's Executive Director, to find out more. Lee: Hi David! Thanks so much for taking the time to talk about your GLBTQ Online High School. Here's my first question, and it's really voicing my initial skepticism: is the GLBTQ Online High School sort of giving up on making regular High Schools safe places for GLBTQ Teens? Or is that the wrong question - is it more about a single teen giving up on THEIR high school? David: That's a very important question, Lee. We're all in favor of all the work that has been going on for years to make schools safer for glbtq youth. However, as you said in your introduction, even after all that work, over 85% of glbtq students still report experiencing harassment at school. Changing school systems and changing attitudes can take a very, very long time. While that happens, we believe there need to be other options for students. We can't look at a kid who's having a difficult time in school and say, "give us a few years to work with the school system and see what we can do." That kid's going to be long gone before any real change occurs. In the meantime, what do we say to the kids? Tough it out or drop out. What kind of choice is that? Now we can tell them they have an option. Although it's easiest to focus on GLBTQ Online High School taking away the negatives from a student's typical experience, our school does more than that. We also provide connections to other youth and youth services around the country. Even if a student's high school treats them well, students may not have easy access to glbtq peers or supportive adults. We can provide that community and support in a safe, academic environment. That doesn't necessarily require giving up on the local school, but rather recognizing that different schools can provide different options. The option of GLBTQ Online High School isn't for everyone - but neither are local schools. And just one other point: If you really want to change school systems, provide choices for kids. As families choose to move students out of local school systems, school administrators wake up and recognize that they're failing to meet some kids' needs. Our school provides an option for families that may help administrators think about what else they could or should be doing for their glbtq youth. Lee: So how does an online high school work? Are there classes at specific times with teachers, do you use video chats or instant messaging, or is it more like online traffic school, working through a set program and then taking a multiple choice test? David: There are lots of different types of online high schools, so I’ll just focus on how our particular school works. We’ve designed an extremely flexible and highly interactive type of online program that works well for full-time and part-time students with a wide variety of scheduling and pacing needs. We’ll do whatever works best for each individual student. For example, we function on a rolling-enrollment, year-round basis so that students can start any course on any day of the year. Each student has an individualized learning plan that sets goals for the courses they need and the pace at which they want to complete those courses. Teachers work with each student individually at their preferred pace and are available to assist students every step of the way. Lots of multimedia in our courses make them very engaging and highly interactive. Teachers carefully monitor student progress, provide assistance whenever necessary, and communicate regularly with parents or guardians. To maintain maximum flexibility, we don’t require synchronous chats or video conferencing, but those tools are available if a student wishes to work with a teacher that way. Of course, whenever we need to we also use that two-way synchronous audio communication device called a telephone. Lee: Okay, that made me laugh. "Two-way synchronous audio communication device." Nice. So, what are the opportunities for students in the program to interact with each other? Is there a social component to attending GLBTQ Online High School, or is it all about the academics? David: Our primary focus is providing a high quality academic experience, but we strongly believe that the education will be far more valuable and more fun if students can connect with their peers in multiple ways. Naturally, there are class discussions in which students can interact with each other, and we have extracurricular activities such as a writing club led by a published queer author. We also have discussion areas just for light, social conversation. We call that area of the school the “Lazy Lizard Social Club,” and it’s a place where students can talk about sports, movies, or whatever. Discussions are within the school’s secure environment, so they’re open only to our students and staff. As the school grows, we look forward to the day when we have enough students in some cities to have face-to-face social gatherings to further enhance the students’ connections to each other and to the larger community. Lee: Can you tell us how many students are enrolled in GLBTQ Online HS going into this new regular-calendar school year, and what you envision in terms of future growth? David: This is our first full school year, and we’re starting small with just a handful of students. Interest is continuing to grow, and we’re about to launch a new marketing campaign via a Google grant we received. We anticipate serving about 50 students this year. We are designed to expand as necessary, and would like to hit 150 students within the next 2 years. Lee: It's pretty exciting that you have a scholarship program (with Greg Louganis!) Is it purely need-based? Do students apply separately to it? What criteria are the scholarship committee looking at? David: Yes, indeed! We’re thrilled to have Greg on our team! He is a great role model for the students and is sure to bring plenty of positive attention to the school. The scholarship is based solely on need, and students can apply at the same time of their application or following their admission to the school. Once we build up the funds to the desired level, full and partial scholarships will be available to both full- and part-time students. Besides collecting donations for Greg’s scholarship, we’re also in the process of contacting other individuals who may be interested in sponsoring additional scholarships. Lee: Okay, David. Last question: I'm curious about your personal connection with the school and the whole idea of a GLBTQ Online High School. How did this become your passion, and your job? David: This is always a difficult question for me to answer succinctly because there are so many factors that have contributed to this being the right school at the right time for me personally and for the educational landscape. The short answer is that for almost 20 years, I’ve been very interested in how schools can successfully educate populations who have previously been underserved and disenfranchised by the system. Virtual schools provide a powerful tool for doing that, and glbtq students are certainly a group that has been highly underserved, dis-served, and disenfranchised by our system. We have the tools to do a better job and provide a better education to these kids right now, so let’s do it! Over the last couple years, I’ve been reading about Chicago Public School’s efforts to start a bricks & mortar school for GLBTQ youth. They failed. 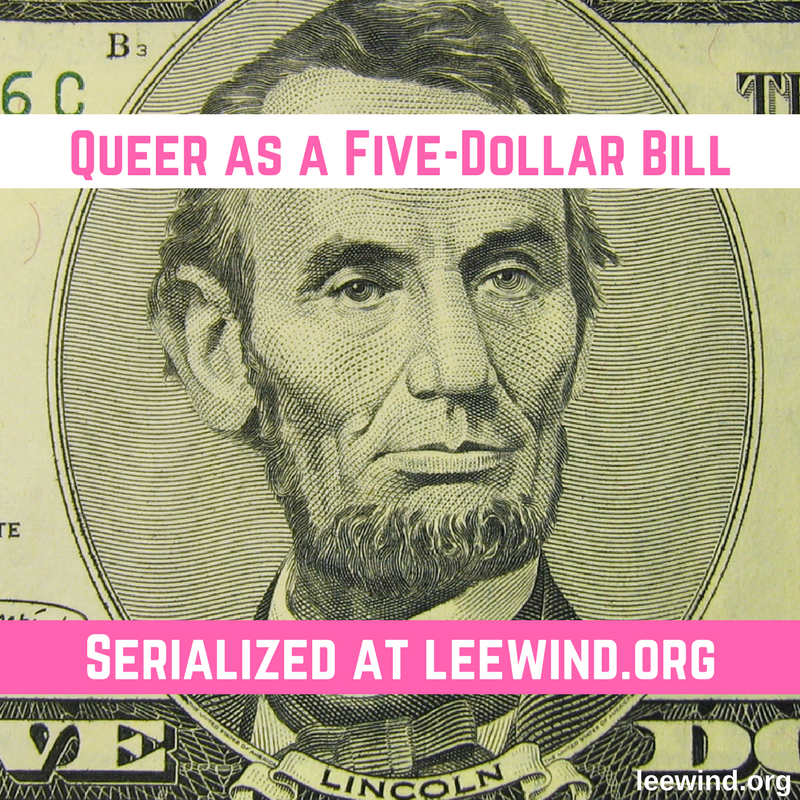 Politics, homophobia, and splits even within the queer community led to that failure, and the kids that wanted or needed their own school in order to be among their peers were denied the opportunity. It was obvious to me that the time was right for an online school for queer kids. This school could serve not only the kids in urban areas like Chicago that have no such schools, but it could also serve kids in rural areas that have few local peers and no way to connect to other queer kids – at least not in a safe, academic environment. This school could even serve kids around the world in countries where homosexuality and queerness are crimes. It was also obvious that we would need to be independent of local politics and the whims of a school board. Anything that relied on tax dollars was subject to major objections, so creating an online private school was the obvious choice. Since at least the sixth grade, I have memories of thinking homophobia made no sense. So what if that teacher was gay? Why do those kids always pick on the one they call “sissy?” In high school, if I knew I was straight and my girlfriend knew I was straight, what did I care if someone misinterpreted a comment I made and might think I was gay? “Accused of being gay.” Like that was a bad thing? When I was a young teacher and that brave young man requested to speak to the entire student body to come out and describe how that school’s environment was hostile to gay students, why did the head of the school refuse to attend the meeting? Why did some of that student’s teachers start making nasty comments in class? As a teacher in rural Minnesota when I witnessed some of the comments heard all too often in schools, I put a stop to it as best I could. Why did the kids respond by saying that none of the other teachers ever objected to that kind of language? When I worked for the Department of Education and someone put a box of Humans Unafraid of Gays (HUG) buttons out and available for staff, why did the department leaders take that box away within minutes? How would these incidents make me feel? My first year of teaching in Minnesota was in a small, rural district. It was hell. Students and parents objected to my teaching to the high standards I had come to expect from my previous school. Teachers who had been in the district looked at me with suspicion because I didn’t always use the cookie‐cutter approach promoted by the textbooks. And then, when it became known that I was (gasp!) Jewish, the real hell began. Swastikas on my chalkboard and carved into my desk. Taunting in the hallways. Ineffective disciplinary response from the administration. Public humiliation at the required‐attendance Christmas assembly held during school. A school board who criticized me for being too sensitive. People who called themselves my friends asking, “Isn’t it like this everywhere?” or “Shouldn’t you just get used to it?” Or even trying to lighten the mood by telling Jewish jokes. The loneliness of isolation in the midst of a community I couldn’t call my own. In the “old days” before the Internet, we were able to and required to live largely in our own neighborhoods. We may have been bused across town for school as I was, but that’s as far as we had to go. As kids, our options were limited by what and who was within the distance we could ride our bikes. We had three television stations. Relatively speaking, we were isolated by geography and limited in our contacts to the people we saw. Now there’s Facebook and Twitter and virtual schools and a 24‐hour news cycle and hundreds of television channels specializing in our every interest. We have more choices. Nowhere does anyone’s life have to revolve around just the limited people in their immediate vicinity. We have tools and techniques to connect on a world‐ wide basis with the entire range of humanity. We can create communities in which each and every individual can thrive. So why create GLBTQ Online High School? Because it is needed and because we can. And that’s the only answer we really need. 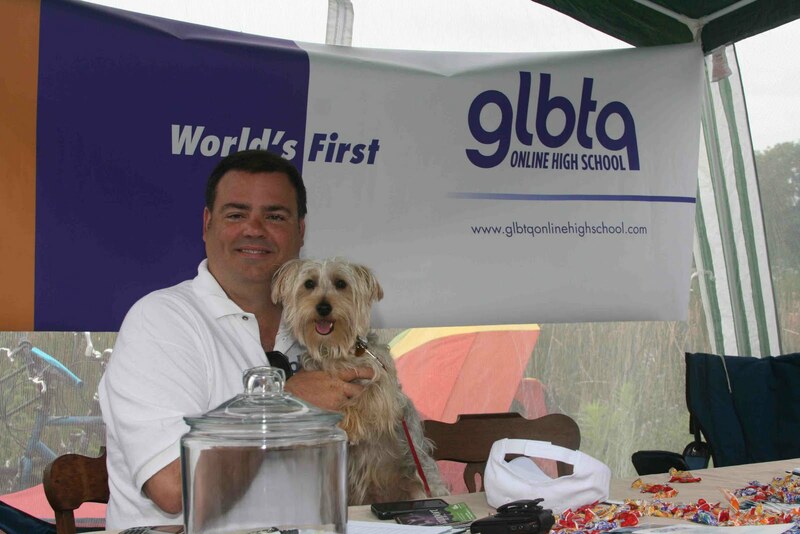 My thanks to David Glick for his time and for sharing his passion about the GLBTQ Online High School. For more info on The GLBTQ Online High School, check out their website here. "In the meantime, what do we say to the kids? Tough it out or drop out. What kind of choice is that?" It's tragic that it's seen as the gay kids' problem. Of course we shouldn't be telling them tough it out; we should be telling their harassers, "Knock it off or drop out." That warms my heart and it sounds like a really well thought out initiative. Children are the future, but in so many ways the education system is designed to look past the kids that are right there, right now and focus on fixing things for later generations. Each generation of kids passes from being the future to being that generation that gets snarked at by the press for being no good losers without education systems really providing anything for them to work with. I wonder how much the ranks of each passed over, snarked at generation are swelled by gay kids who just didn't get the support they needed to develop.